“Slightly east of the water tower… lay a small cemetery… a forgotten part of a colorful history the new campus site acquired,” wrote Dr. George Hallam in 1988, a Jacksonville University (JU) Professor and author of Our Place in the Sun. Since the publishing of his book, many have taken notice of the history beneath JU’s stately oaks and green lawns. Over the decades this “forgotten part” inspired students to write about it, historians to study it, and still others to commemorate it. It is the story of the freed and the oppressed. The brave and the heroic. The lost and the found. On January 10, 1861, Florida seceded from the Union. President Lincoln’s Emancipation Proclamation went into effect January 1, 1863, due to the ongoing rebellion of Southern states. A few days later, Civil War raged and three African American Jacksonville men joined the fight. William Johnson, Sylvester Williams, and a man who was named, or honored the president by taking the name, Abraham Lincoln, enlisted in the 1st South Carolina regiment of the Union army. Dr. Craig Buettinger, Emeritus Professor of History at JU, has researched the plight of Johnson and others from that era. After all, Johnson has a deep connection to JU. His badly weathered military headstone passed many decades on campus, alongside the resting places of one or more other black Civil War soldiers. Behind the present-day Art Annex and Physical Plant, the graves were later discovered by JU employees. Johnson and his fellow freedmen enlisted at Fort Clinch on Amelia Island. He had worked as a field hand, as did Williams. Both men were 21 years old. The man called Lincoln was a lumberman and only 18. Johnson advanced to corporal during the war. Duval County census schedules from 1860, Buettinger said, did not list Johnson and Williams among free persons. It is likely that they, along with Lincoln, had been enslaved prior to enlistment. 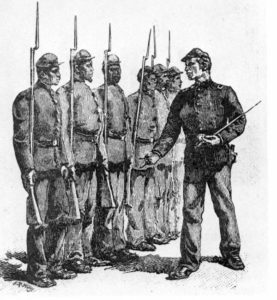 The regiment, later designated the 33rd USCT (United States Colored Troops), was one of the first African-American regiments mustered into service by Union leaders. Operating mostly in South Carolina, it did move into Jacksonville twice during the war. The Battle of Olustee, the bloodiest battle in Florida, was waged less than 80 miles from JU’s campus. 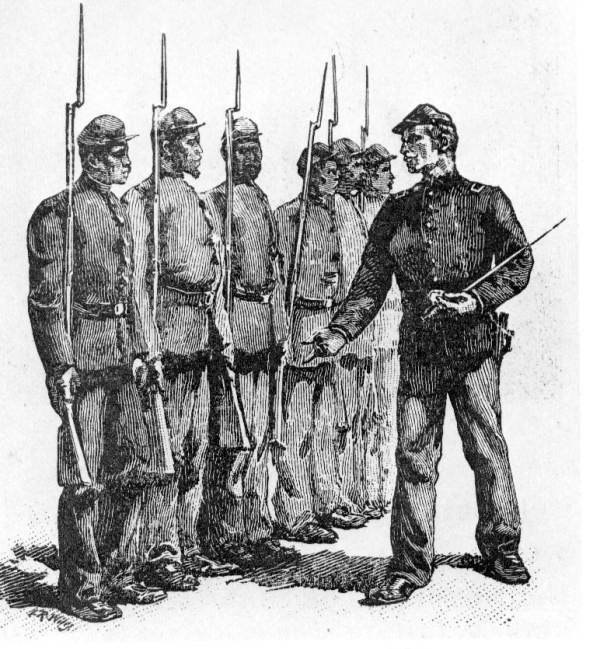 Three USCT regiments fought for the Union in that battle and many died. The 33rd just missed Olustee and Corporal Johnson was not among those lost to the war. Records indicate that by 1880 he resided in Mayport with his wife. In 1989, Navigator staff reporter Kim Lanier interviewed Jim Golden, then Supervisor of Housekeeping at JU. After 24 years of service in the U.S. Army, he had an active interest in veteran gravesites, particularly those dating back to the Civil War. The Navigator 1989 article contained the only known photo of Johnson’s headstone. Golden noted that the Confederate Army operated a battery at St. Johns Bluff in 1861. The late JU history professor George E. Buker, an expert on Jacksonville’s maritime history, studied how the Union navy patrolled the St. Johns through most of the war. The St. Johns River was a contested and dangerous place during the Civil War, where students now enjoy the riverfront, study marine science, or practice with JU’s Rowing and Sailing teams. Sometime between his 1989 discovery and a 1994 Navigator article about Johnson, the headstone went missing. Golden told Lanier that he hoped to write a book containing research and artifacts collected over the years, with help from JU professors. During and after the Civil War, Jacksonville was occupied by Union forces. 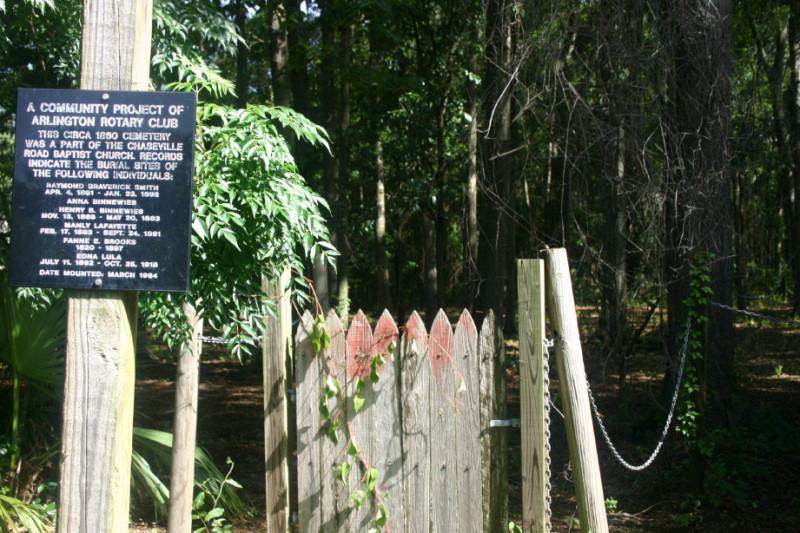 According to Hallam, James E. Merrill, a giant in the shipbuilding industry, owned a beautiful stretch of riverfront acreage when Jacksonville University began searching for its permanent campus home. Merrill purchased the land from Robert Hall and Hallam writes that as many as 13 deed holders preceded the University purchase of the land. That list of landowners included the Benneweis family (c. 1883-1918) and Anna Madgigine Jai, African wife of the cotton planter and slave trader Zephaniah Kingsley. The “front” northern corner of the property contained a cemetery overseen by the African Methodist Episcopal Church starting in 1873. 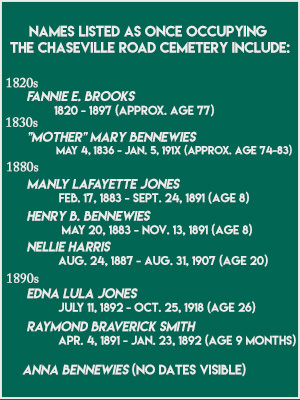 A decade later, Chaseville Road Baptist Church was using the cemetery. What is now University Boulevard North was originally called Chase Ville Road, from which the church took its name. Circa 1920, the Chaseville Church burned to the ground, marking the end of cemetery interments. 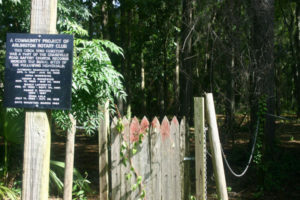 Reportedly, less than a dozen original graves, many pre-Civil War, were later relocated to Jacksonville’s Evergreen Cemetery. Today, it is unclear exactly how many burials took place and whose remains still lie undisturbed at the historic site on campus. 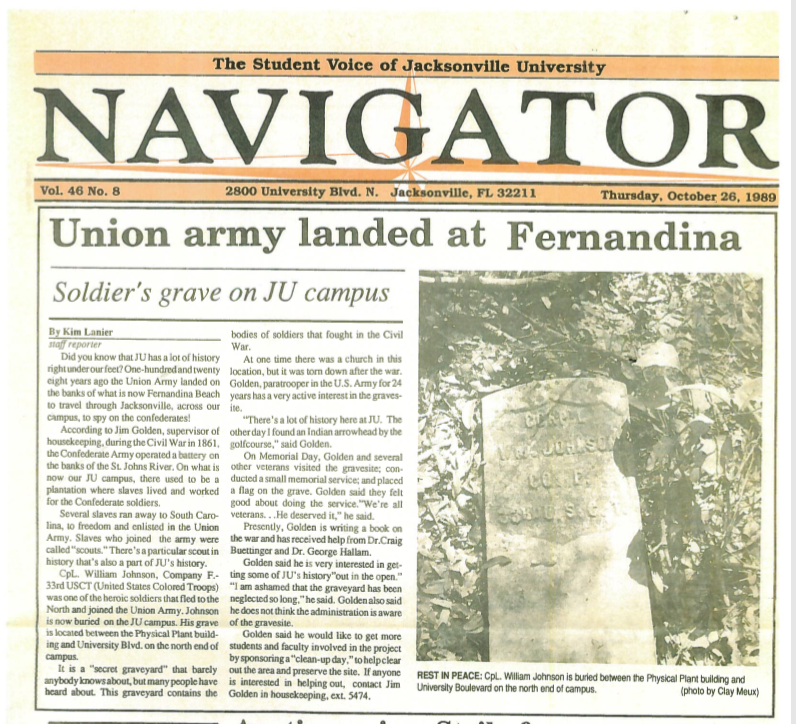 In 1994, The Navigator again reported on the JU gravesites. They interviewed Business Administration major Theresa Richardson ’96. Her research supported her Western Civilization II course requirements. 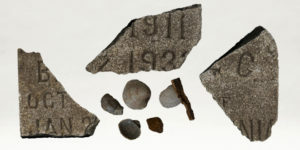 Richardson cited two cemeteries—the second site allegedly between the Carl S. Swisher Library and the JU Athletics Field House. The cemetery fronting University Boulevard was the larger of the two and the undisputed resting place of USCT members. The second, more interior site has not been confirmed or disproven. Talk of its existence, though, may have risen during the first building phase of JU’s Village Apartments. At that time, many speculated that an adjoining parking lot was a Native-American burial mound. She also told Navigator readers in 1994 of the African-American police officers who shared the Chaseville cemetery with Johnson and others. According to her findings, burial of African-American officers in Old City Cemetery was not permitted. Hearsay suggested that the officers were instead buried at Chaseville. Richardson conducted her research during a politically charged time in Jacksonville. Nathaniel “Nat” Glover was campaigning for Sheriff. In 1995, he became the first African American elected as sheriff. Not only a milestone for Jacksonville but also for Florida—a first since the end of Reconstruction. But Richardson also shared that Glover’s election was not the first time minority officers led Jacksonville’s police force. 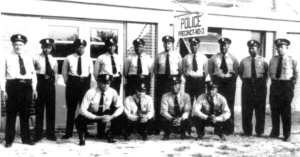 The Florida wilderness now known as Jacksonville had a distinct police presence since its founding. By April 1870, several freedmen were elected in Jacksonville. Five police officers, two jailers, two constables, and one member of the Board of Police Commissioners. In 1872, Emmanuel Fortune became the first African-American Town Marshal. In 1878, George H. Mays was elected the City’s first African-American Police Sergeant. 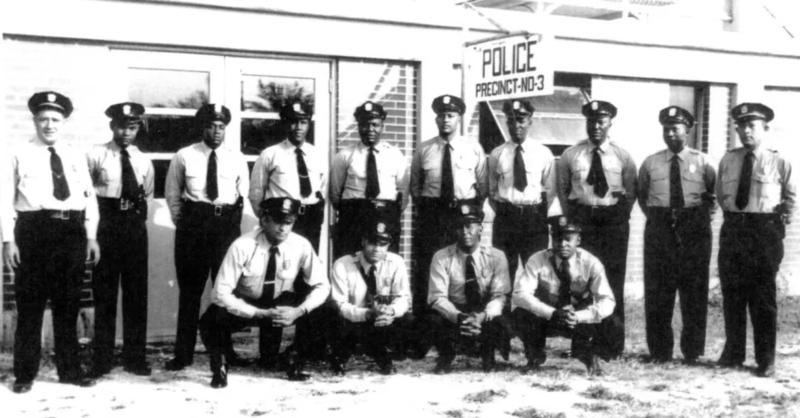 And by December 1887, African Americans comprised 15 out of 24 positions on Jacksonville’s police force. Much has changed since the time Johnson and other former slaves walked the acres now occupied by professors, thousands of students, and more than 10,000 campus visitors last year. Since that time, Jacksonville not only elected Glover, but also its first African-American mayor, Alvin Brown, an alumnus of JU. But inside the shade and quiet of the pre-1900 cemetery, progress moves slower. 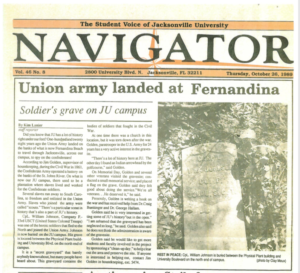 In 2003, a group of JU students invited Old Arlington, Inc. (OAI) to help facilitate a cemetery clean-up event. The Jacksonville University Student Alliance (JUSA) announced plans to renovate the site as a historical landmark. Students hoped to garner additional support from OAI, JU’s Black Student Union (BSU), and the surrounding community to install a memorial plaque and/or statue. The Arlington Rotary Club initiated a community project focused on the site’s restoration in 2006. As part of their efforts, a sign was installed to memorialize the members of the Benneweis family buried there. Two years ago, the University contracted Geomatics, a local surveying and mapping firm, to conduct survey work. They mapped the boundaries of the cemetery parcel and updated its post-and-chain fencing. 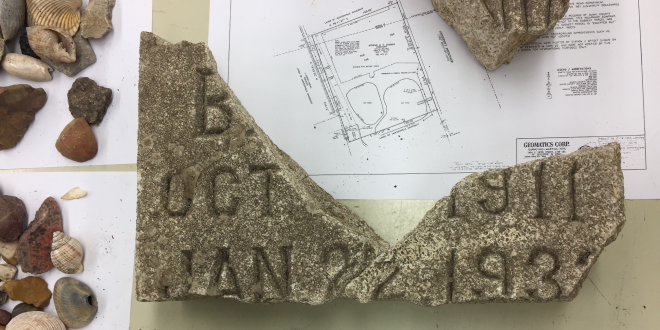 On February 1, the Carl S. Swisher Library opened a month-long display of gravesite remnants and other artifacts. For more information, contact Special Collections. RESEARCH CREDIT: Mike Bobbin, Executive Director of Campus Services; Dr. Craig Buettinger, Emeritus Professor of History; Adam Solomon, Special Collections Archivist & Digital Services Specialist; Sheri Webber, Staff Writer & Editorial Services Coordinator.